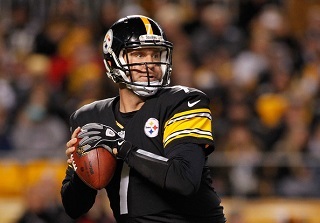 Ben is the first QB in NFL history to throw six touchdown passes in back-to-back games. “It didn’t start out really pretty at all!” — Ben. “I don’t think any of us are surprised by anything he does. We have been looking at it for some time.” — Coach Tomlin. “You could have never sold me that during the week, even though he did it last week. He had a [heck] of a day. That’s a reflection on us all. You got to go out there and you’ve got to stop him no matter the situation.” — Ravens linebacker Terrell Suggs. Steelers quarterback Ben Roethlisberger threw for six touchdowns for the second straight week. The Elias Sports Bureau notes that he’s the first quarterback to throw 12 touchdown passes in a two-week span. Roethlisberger joined Y.A. Tittle (1962) as the only quarterbacks with a pair of games with at least six touchdown passes in the same season. The only quarterback with more games with at least six touchdown passes in his career is Peyton Manning, with three. “It means guys are catching touchdowns, and it’s fun because…especially that last one. I was so happy for Matt [Spaeth], that was such a big play for him and I was so excited for a guy that has been around a long time and that puts a lot of dirty work in, if you will, a lot of blocking – we don’t ask him to do a lot except block – for him to get that big touchdown and play, I was excited for him!” — Ben, on what the record means. What was the standout stat from Roethlisberger’s past two weeks? In Roethlisberger’s first seven games, he completed 45 percent of his throws that traveled at least 15 yards downfield. Last week he was 8-for-11 for 209 yards and two touchdowns on those throws. Sunday, he was more efficient, 6-for-9, with five touchdowns thrown at least that far. 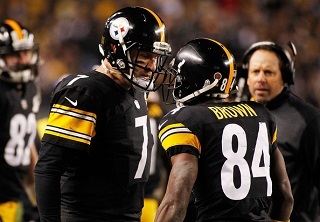 Roethlisberger made great use of his primary target, Antonio Brown, who had 11 catches for 144 yards. Antonion Brown has at least 80 receiving yards in an NFL record 11 straight games. “It was just a perfect night for football. To honor Mr. Greene is just so great. It was really just an awesome thing. We wanted to go out and put a show on for our fans, and to make Mr. Greene, and all those other former players proud.” — Ben. Ben Roethlisberger threw for 340 yards and six scores to set an NFL record for most touchdown passes in consecutive games, leading the Pittsburgh Steelers to a 43-23 victory over the Baltimore Ravens on Sunday night. A week after passing for a franchise-record six touchdowns against Indianapolis, Roethlisberger duplicated the feat as Pittsburgh (6-3) earned its third consecutive win. Roethlisberger’s 12 touchdown passes over the last two games broke the mark of 11 set by Tom Flores for Oakland in 1963 and matched by New England’s Tom Brady in 2007. The renewal of one of the NFL’s most physical rivalries traded its usual taut, low-scoring style for something decidedly more spectacular but no less physical. When Roethlisberger wasn’t dissecting Baltimore’s depleted secondary with his expanding number of targets, the teams were trading punches and penalties. Just not the lead, not after a resurgent Pittsburgh defense gave Roethlisberger all the momentum he would need to continue the finest stretch of his 11-year career. 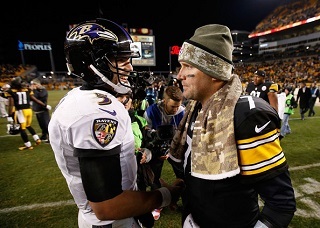 The Ravens were in front, 7-0, midway through the second quarter and the Steelers were sputtering when a little vintage Pittsburgh defense — led by suddenly youthful 36-year-old linebacker James Harrison — turned the tide. Cornerback Brice McCain raced 26 yards following a Lorenzo Taliaferro fumble to set up a 5-yard touchdown pass from Roethlisberger to Le’Veon Bell, and Jason Worilds picked off Flacco and returned it 30 yards to put Roethlisberger in position to find Bryant for a 19-yard score to put the Steelers up 14-7. The Ravens, playing without injured cornerback Jimmy Smith, simply couldn’t keep up. Roethlisberger ended the half with a perfect 47-yard strike to Markus Wheaton. ‘‘We took advantage of turnovers our defense gave us. We were slow starting but made plays down the stretch.’’ — Ben. Even when things went wrong, they went right for Pittsburgh. The Steelers tacked on a 2-point conversion following Wheaton’s score when punter Brad Wing made up for a botched hold by scrambling to his right and connecting with tight end Matt Spaeth to make it 22-10 at the break. Rather than sit on the lead, the Steelers kept attacking. Roethlisberger’s 25 completions went to eight receivers, though he relied on an old one and his new favorite to help the Steelers end a pivotal three-game homestand with a perfect 3-0 record. Things were typically heated. Both sides were called for personal fouls for late hits to the opposing quarterbacks, and the Ravens drew three defensive flags on one play in the second quarter. Baltimore linebacker Terrell Suggs earned a 15-yard penalty for an ugly shot at the knees of Steelers running back LeGarrette Blount. Teammate Elvis Dumervil picked up another penalty two plays later after smacking Bell. Roethlisberger took a shot to the jaw from linebacker Courtney Upshaw that left the quarterback comically stretching his face trying to check for damage. He could afford to smile after the Steelers bounced back from a rough start. Last week, in the game against Indianapolis, Ben Roethlisberger got close to Norm Van Brocklin’s NFL record for passing yards in a game. This week, he got himself an NFL record, albeit in a different category. Ben Roethlisberger completed 25-of-37 for 340 yards, with six touchdowns and no interceptions, which translated into a passer rating of 136.3, and his play was a critical element in the Steelers’ 43-23 win over the Baltimore Ravens on Sunday night at Heinz Field. The six touchdown passes vs. the Ravens, coupled with his six-touchdown performance last week against Indianapolis, gave Roethlisberger 12 touchdown passes in two weeks, and that was the NFL record. He became the first quarterback in NFL history to pass for six touchdowns in consecutive games. Roethlisberger is the Steelers Digest Player of the Week. You can read more & watch video highlights here. You can watch Ben’s post-game press-conference here. You can also check out some game photos here.